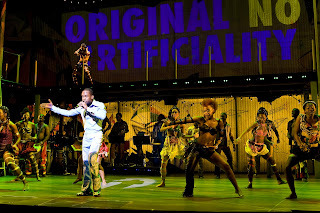 Given the concert conceit of Fela!, and the audience participation that its stars encourage, I wish they’d just ripped the first ten rows out of the orchestra and sold those spots for ten bucks to music lovers. It probably would’ve violated a fire code or some union contract, but it also might’ve helped the energy in the crowd match the exceptional energy onstage. First of all, the $10-general-admission-pit rush idea is brilliant. It made me excited just to read and consider the notion. I can just imagine how much fervor that would draw out of fans, or rather how much more enthused it would make theater goers about the show. People would feel rabid about this show, like they feel about the Hair revival, spurred on by the nightly invitation for the audience to come dance on stage. A $10 price would be perfect to not only match up with the fact that there would be no seat, but also to reflect the atmosphere and realism of the story’s setting. It certainly didn’t cost $85 to get into Fela’s Shrine nightclub. In the words of Melchior in Spring Awakening, “HHHHNNNOOOOOO! !” Next to Normal will end its excellent rush policy October 12 and begin a ticket lottery for day-of seats. Granted, this means no more cold, early mornings, but with it comes the uncertainty of seeing the show. I am greatly disappointed by this news, not only because it makes getting rush tickets for the Yorkey/Kitt musical significantly more difficult, but I’ve always felt the “snobby,” we’re-too-good-for-you shows employ ticket lottos. Let the facts speak for themselves. Hair, In The Heights, Rock of Ages, Shrek, West Side Story, and Wicked all hold ticket lottos. With few exceptions, these are shows that generally sell at least 90 percent of their tickets every week. Shrek is an odd beast in that it hasn’t consistently sold well since it’s opening last December and it also has a (overly-priced) student rush policy. In The Heights was a huge seller for a year after its 2008 Tony win for Best Musical, but has recently dipped to dangerously low numbers (some suspect it might close in January). But Hair, Rock of Ages, and West Side Story are monster-sellers and crowd pleasers, not to even mention the mega-bucks earnings of Wicked, which always sells out the 1,809-seat Gershwin (aka. the largest Broadway theater). 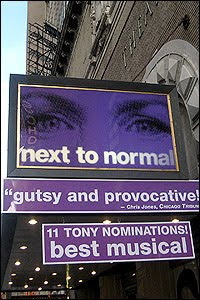 Now in my mind, Next to Normal is the best musical currently on Broadway. 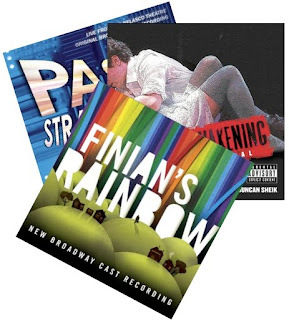 But we have to think of this from a mainstream perspective: Next to Normal is no Wicked. The show has been on a massive high from its Tony wins, but attendance has slipped to the high 80s in recent weeks (still strong, but a decline nonetheless). And Broadway’s prized theatergoers—families with kids—are not going to see this show. And there is nothing wrong with that. Next to Normal caters to theatergoers who aren’t afraid of a dark, depressing, thought-provoking show. But this is not the show to start a ticket lottery with. As much as I’d hate to see its sales suffer, I would be surprised if it maintains its current momentum into the post-holiday winter. Lotteries are for shows—such as Wicked and Hair—that have certain longevity. But if recent trends have taught us anything, is anything on Broadway certain? What do you think, Stage Rushers? Are you happy about this new lotto policy for Next to Normal, or are you clenching your fists in an anguished grip? PS: In perusing the updated show rush policies, I noticed that the new musical Memphis, currently in previews, has a rush policy “in effect only for preview performances.” Memphis, I really want to see you; I do. But let’s not play the we-can’t-have-a-rush-policy-because-we’re-going-to-be-too-popular card until we’ve opened, shall we? 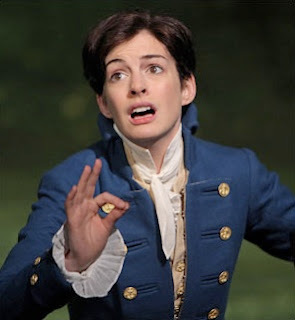 I love Anne Hathaway. Like, love her. So when I heard she was doing Shakespeare in the Park’s Twelfth Night this summer with Raul Esparza, my other favorite actor, I couldn’t contain my excitement. 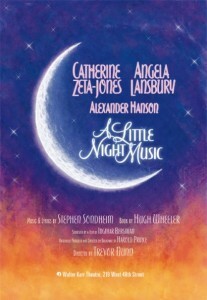 In fact, I tweeted on April 15 “Raul Esparza has been cast in Twelfth Night, which is already starring Anne Hathaway. I’m getting in line NOW!” Little did I know I should have followed through with that tweet.